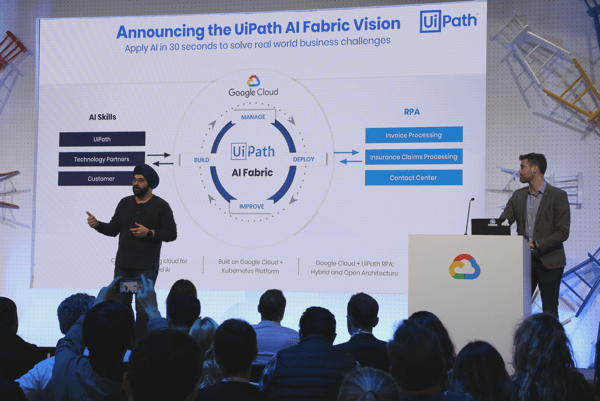 On April 10, 2019, UiPath's VP of AI, PD Singh, unveiled the the UiPath AI Fabric vision during the “Thriving in the Age of Deployed AI" presentation at Google Next. Read on to learn more about this exciting announcement. The past year has been a momentous one for the Robotic Process Automation (RPA) industry. RPA has delivered historic growth and made its way to the mainstream in the minds of customers and analysts. This growth has been fueled by a unique value proposition: RPA’s ability to automate well-defined, rules-based business tasks, with a low code, and easy to implement approach. With RPA, customers have been able to quickly solve real-world business challenges and realize a rapid return on their RPA investments. However, as is often the case, success has delivered a set of raised expectations and the question, “What comes next?”. This excitement around RPA has driven customers to push the technology’s automation capabilities and customers have achieved incredible things with RPA. At the same time, it has become clear that there is a limit to the ability of RPA alone to automate more complex tasks. RPA can seamlessly interact with structured data found in spreadsheets and automate line of business (LOB) applications. However, there are challenges to using RPA to automate more cognitive processes, such as calculating the likelihood of a consumer defaulting on a loan or predicting readmission risk of a patient. As customers have looked to take the next step on their automation journey, many of them have also explored another technology which has recently gone through its own renaissance: artificial intelligence (AI). Recognize images on a screen with human-like accuracy. Extract critical information from millions of invoices and inputting it into an accounts payable (AP) system. Instantly solve customer service requests by understanding natural language from voice and text inputs. Customers began to see limitless potential for what AI could achieve for their business. In reality, it was just that—potential. There were major challenges in being able to apply AI to solve real-world problems. In fact, despite all the excitement surrounding the technology, Gartner estimates that only 4% of Chief Information Officers (CIO’s) have successfully implemented AI. So, why haven’t RPA and AI, two technologies which have delivered such high expectations, fully come together to deliver on the shared promise of ushering in a new age of more intelligent automation? Over the past year, we’ve asked our customers the same question. We’ve learned that there are three barriers preventing RPA and AI from seamlessly working together: operations, technology, and process. First, in operations the Robotic Operations Center (ROC) and data science teams usually exist independently as silos with different skill sets, focus, and business priorities. Second, from a technology standpoint, RPA developers use an RPA platform to build, deploy, and manage automations. Meanwhile, data scientists use dedicated AI/machine learning (ML) modeling tools. These tools, pipelines, and technologies are completely disconnected. Finally, RPA and AI are managed as separate processes. When trying to incorporate AI models, the ROC doesn’t know if the model is producing the right output or if the model has been updated. The data science team doesn’t know if the models are being used correctly and how useful the models are. This creates a fundamental disconnect that dooms the potentially symbiotic RPA and AI relationship. To summarize, RPA and AI exist in separate silos. To truly meet their full automation potential, we need to break down these barriers, merging the seamless implementation of RPA with the limitless cognitive power of AI. Today, we are excited to announce our vision to bridge these two worlds: UiPath AI Fabric. Seamless drag and drop interface will allow you to deploy AI models into an RPA workflow in seconds. Deploy AI as simply as you deploy a UiPath Robot. Operationalize AI models developed by UiPath, from over 60 AI technology partners, or use custom models built by your own data science teams. Deliver end-to-end visibility of model versioning and updates. Your RPA teams will know when models have been updated, and your data science teams will know how your models are being used in production. Analyze model performance and impact with advanced model management and monitoring. Close the RPA/AI data feedback loop to enable continuous improvement of AI models over time. UiPath AI Fabric will allow you to deploy and manage your AI models in UiPath Orchestrator, then drag and drop them right into your RPA workflows via UiPath Studio. AI and RPA are coming together to accelerate your Automation First journey. We will have a lot more to share on AI Fabric over the coming months and we are looking forward to launching a private preview in Q3 of 2019. In the meantime, we invite you to join our upcoming webinar “How to Supercharge your RPA Strategy with AI” to learn more about AI Fabric and hear from PD Singh, Vice President of AI at UiPath, about how AI is transforming Robotic Process Automation. Anton McGonnell is the Director of AI Product Management at UiPath.